A daily dose of Dredd-verse comics. 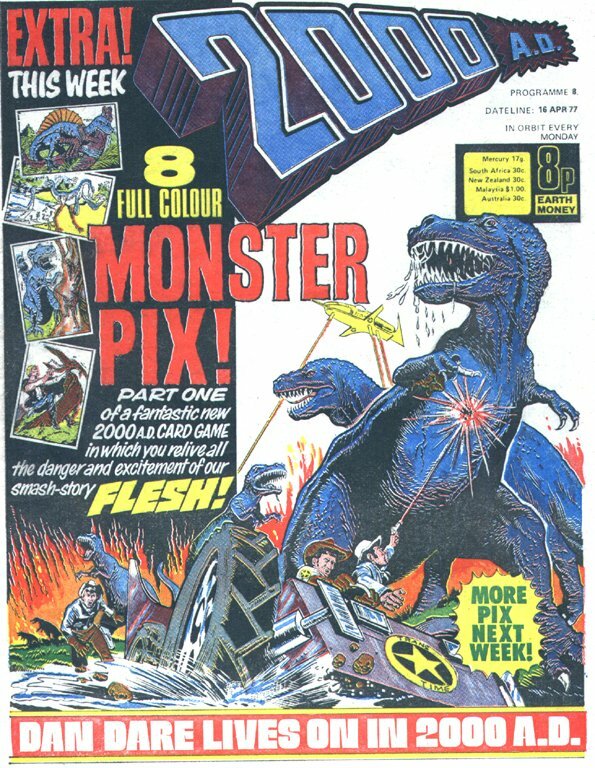 Accompanied by a Flesh cover by Boix, a Flesh cutout card game and Invasion, Dan Dare, Flesh, Harlem Heroes and M.A.C.H.1 strips. The Complete Judge Dredd 1 and Judge Dredd The Complete Case Files 01. 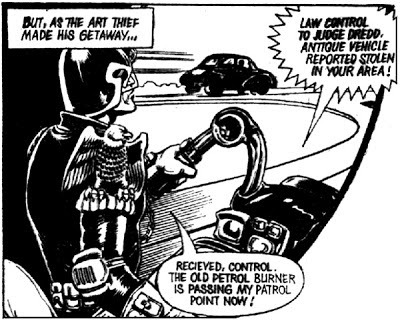 Dredd follows a gang engaged in art theft auto. First reference to the reader being in the present day and therefore that Dredd's adventures take place in our future. First time Dredd removes his helmet. The currency of Mega-City One is credits. There are new motorised walkways called High-Speed Walk-Eezee that can travel at 500 feet per second, the Judges can order them to change their speed or direction. Krilz's Auto Market (or Krilz Kars) stocks antique cars and uses Plastic Skin Coating to respray them. By 2099, antique cars have become highly prized and are considered works of art. A 1959 Antique Morris Minor is now worth 500,000 credits. A Cadillac and one of the last ten Ford Cortinas left in the world and have recently been stolen in the same sector of Mega-City One. Newer vehicles, including Judge's Lawmaster bikes, don't use petrol. Judge's helmets have infra-red night sight and their guns can fire high explosive bullets. Dredd's face is apparently hideous. The owner of Krilz's Auto Market, with a sideline in stealing cars old enough they qualify to be considered art theft. He has has three employees, one of whom is called Lester. Four. Georgie, the owner of the Morris Minor is killed by Lester during its theft and later Dredd kills Lester and Krilz' two other henchmen with one shot. Appalled Lawbreaker: "Aargh! 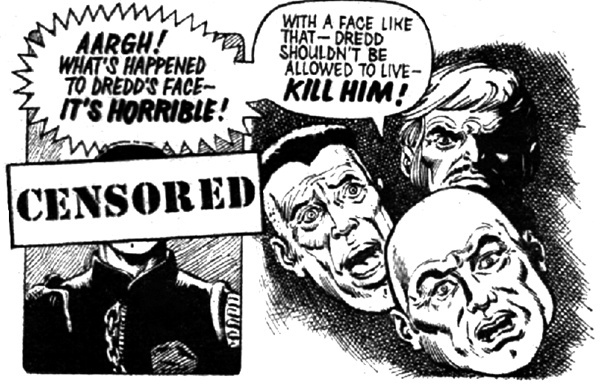 What's happened to Dredd's face - It's horrible!. With a face like that he shouldn't be allowed to live - Kill him!" Dredd: "Yes, Lawbreaker Krilz! I ordered the Walk-Eezee to be put in reverse! Something which must never happen to the law!" At one point "Received" is spelled incorrectly. It might not have been in 1977, but reading it now a Ford Cortina is much funnier than a Morris Minor. The walkway can move at 500 feet per second, which is 341 miles per hour, so just staying on your feet would be quite impressive. There are no credits printed in the strip itself and so the following are taken from Barney. Charles Herring only wrote one more strip for 2000 A.D., a M.A.C.H.1 strip called The Laser Hound (Prog 12). Massimo Belardinelli only drew Judge Dredd once and instead spent more time with the likes of Ace Trucking Co, Blackhawk, Dan Dare, Flesh, Harlem Heroes, Inferno, M.A.C.H.1, Mean Team, Meltdown Man, Slaine, Tharg The Mighty, The Dead, Time Twisters, The Angry Planet, Medivac 318, Moon Runners, loads of Tharg's Future Shocks and 38 2000 A.D. covers. He died in 2007. The idea of ignominious objects that were commonplace in 1977 becoming antiques by 2099 is great, but it's not really explored here in any depth, nor does the artwork make the Morris Minor seem sufficiently anachronistic among the twenty-first century Mega-City architecture. The story is disjointed and the end is absolutely terrible. It's difficult to say whether this or The Statue Of Judgement is worse. 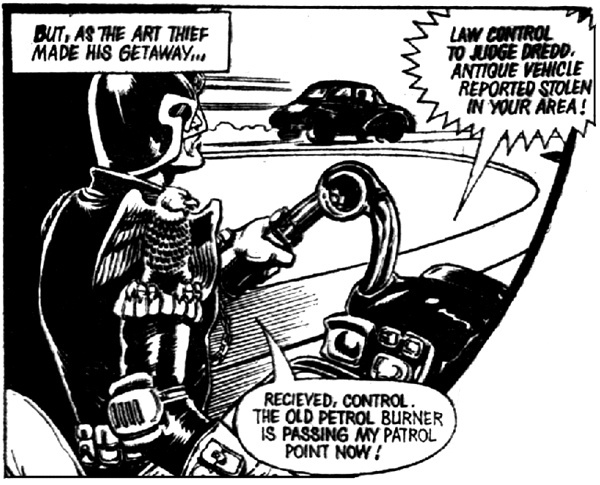 The plan is to examine a new Dredd-verse comic strip each and every day. Further explanation can be found here. MORE JUDGE DREDD ORIGINAL ART FOR SALE!!! Copyright: all images, characters, their likenesses and dialogue attributed to them ©Rebellion A/S. Everything else © D. Black 2012. D. Black has asserted his right under the Copyright, Designs and Patents Act, 1988 to be identified as the author of this work. No copyright infringement is intended.